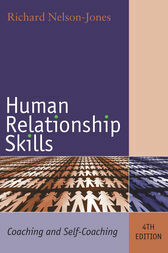 Human Relationship Skills: Coaching and Self-Coaching presents a practical 'how to' guide to relationship skills, showing how readers can improve and, where necessary, repair relationships. This thoroughly revised and updated fourth edition reflects the increased interest in coaching, showing how it can be applied to everyday life. The book concludes with a chapter on how users can maintain and improve their skills by coaching themselves. Accessibly written and using activities, the book will be appropriate for those involved in 'life coaching' as well as general counselling and therapy. It will be essential reading for lecturers, coaches and trainers as well as students and anyone who wishes to improve their relationship skills. Richard Nelson-Jones is a leading international author whose books have helped train many thousands of psychotherapists, counsellors and helpers worldwide. He has held university appointments in Britain and Australia, and is a Fellow of the British and Australian Psychological Societies and of the British Association for Counselling and Psychotherapy.